Barrack Obama came across on the official paper in 1961 as African American as this term was not politically correct until the 1990's. The country of Kenya was not established until 1963 yet Barrack Obama born 1961 to a man listed as from a county that did not exist. The name of the Hospital that BO was born in changed in 1978. The current hospital name was listed on the birth cert. for BO although in 1961 is was different than it is today. Footnote: I live in a county which was established March 3, 1893 by Montana Legislature but the county seat was formed in 1894 without required paperwork. Most interesting, and with verification links provided. This deserves to be put into the light for questioning! This was sent by a Korean War Vet, author, Degree in History. "As you all know, Donald Trump made a big deal about Obama's birth certificate. two extremely strange inconsistencies that merit some attention. Obama's father was born in " Kenya , East Africa ". father have been born in a country that did not yet exist? found that just does not jive. "Kapi'olani Maternity & Gynecological Hospital ". been applied to it until 1978? ... Get ready for November 2012. This letter will look at how well our governments are working in Ravalli County, without the party spin, but with hard facts, and hard truths. Some might remember the documentary commissioned and filmed in the Bitterroot Valley in 2009 named “Beneath the Beauty”. Within that 2 hr. production the Mayor of Hamilton, Jerry Steele is asked about incorporation documents for his city, required for public inspection in Montana under MCA 7-2-4100 and following. The public inspection issue is a problem for our local governments. As many people work for these governments, all of a sudden it has become “all of them” against an individual, or smaller group of people. This newspaper has bravely entered the courts to attempt to warm the heart of Honorable Langton, personally I tried with Honorable Haynes to plead public disclosure of police reports which outweigh personal privacy of an individual, even if they work for a local government. The constitutional right to know is a powerful one in Montana, and our local governments don’t have a terribly good track record if you look at the filing history in the Montana Supreme Court. In 2006 a person named Prindel sued Ravalli County for not releasing documents, and records the failure to release public information. In 1992 it appeared that the Hamilton City Judge was sexually harassed by the sitting Mayor Whitlock, and a group called Citizens to recall Whitlock sued the Mayor to release the investigation due to public concern of the document. The Bitterroot Star, and others sued the County for the release of Geoff Mahar’s complaint against the Ravalli County for similar reasons. Why do our local governments behave so badly? It’s due to the “all of us” against the individual mindset. The interesting part is the admission in official meeting of Mayor Steele in August 2009 of no incorporation public documents for the City of Hamilton. The official plat map indicates the City of Hamilton was annexed to Missoula Co. on September 4, 1890, with no record of incorporation since. Ravalli County was created by the Montana Legislature on March 3, 1893 except that Hamilton relies upon a newspaper article from July 21, 1894 as proof of “incorporation”. Neither the current city clerk nor county clerk can find required public documents for Hamilton’s lawful incorporation. How can these local governments lawfully collect taxes or have employees, elections or any function of a government such as courts, law enforcement? Montana law MCA 7-2-2103 says that a county seat such as Hamilton must be incorporated for a county to lawfully exist. Seeing how the chicken came before the egg for Ravalli County (county created 1893 prior to “incorporation” in 1894 or Marcus Daly founding in 1895) do we wonder why our local governments are behaving so badly? It’s because they don’t lawfully exist, and they don’t need to behave or follow the rules. Open meeting laws, public disclosure of information, partisan infighting, potential issues with civil rights; all due to no desire to be lawful. If we want less government intrusion, public officials can decide to put their pencils down, and stop collecting our taxes. Seeley Lake is a wonderful place to live, because Missoula Co. leaves them alone. With proof that Missoula Co. owns Hamilton, and Ravalli County cannot exist without a legitimate county seat, it’s time to get out the drawing board and chalk out some lawful solutions for our local governments to exist in the Bitterroot Valley. Steve Bullock, candidate for Governor of Montana 2012 just received a strange endorsement recently. On the heels of slamming the Ennis Montana School District Superintendent for improper use of public funds (something Steve Bullock is expert at) he gets the school union endorsement in Montana. Some thing does not add up here for the MEA-MFT CORE union headed by Eric Feaver in Helena. What does make sense is Democratic operatives such as Jim Messina "from Montana" pressuring the union to back Bullock. The question is, do Montana Voters follow unions endorsements into the voting booth? It would be a hard sell to elect a Democrat in any state in the Union after the 2010 windfall for the other corporate party. Steve Bullock used public funds to protect the criminal act of an unsupervised law student, Angela Wetzsteon even though the law student was not a state employee. Eric Feaver should be ashamed of throwing a Superintendent under the UNION Bus, Doug Walsh who served Montana proudly as an Educator professional. Steve Bullock must be nervous if he is calling in favors from Jim Messina by getting a union endorsement. Can't other educators in Montana figure out that this "endorsement" came pretty high up if the same news cycle has a superintendent trashed by Steve Bullock. Ahh Politics in Montana. As in everywhere, its all perception and mostly a steamy pile of bull. Rocky Mountain Labs in Hamilton Montana was allowed to act above the law. It is due to a war time president; is RML engaging in activities that are barred by court order? Top secret clearances, no adherence to law, NEPA law (environmental) and a White House liaison in Dr. Marshall Bloom. Of note arrogant, and fraudulent Public Health Service Officer who engaged in damaging the public's health, knowingly. Welcome to the United States, where crime, abuse of law, rights all happen with Presidential approval. It happens in Hamilton Montana at Rocky Mountain Labs. NEPA complaint follows. An affidavit for conduct unbecoming a PHS officer is inserted after the video showing the endangerment of American's health in the unincorporated City of Hamilton MT. Kelly Hudson's career should be over, smiles to that. "we'll leave it up to the experts now"
RML FRAUD investigation--Crystal Cox Blogger and Michael Spreadbury blog author. This cause of action is for violation of the National Environmental Policy Act (NEPA) as described in 42 USCA §4332 et. seq. ; 40 CFR §1502 and §1503 et. seq. Defendants failed to follow well established guidelines for NEPA, and assess health and safety risks at National Institute of Health facility in Hamilton, Montana known as Rocky Mountain Labs (RML). 1. Michael Spreadbury, a resident and natural person of the State of Montana. 2. The US Department of Health and Human Services, an executive branch department of the United States which must abide by all applicable laws. 3. National Institutes of Health (NIH), a branch of the US Department of Health and Human Services must act in compliance with all applicable laws, based in Bethesda, Maryland. 4. Francis Collins, Director of the National Institutes of Health, the responsible official who must act in compliance with all applicable laws, based in Bethesda, Maryland. 5. Marshall Bloom, Director of Rocky Mountain Labs (RML) affiliated with NIH, is the local responsible official for who must abide by all applicable laws, located in Hamilton, Montana. The Montana US District Court has jurisdiction via 5 USC s. 701 et. seq., 28 USCA 1331 Federal Question, 28 USCA 1336, 28 USCA 2201 et. seq. Declaratory Judgment Act. NEPA 42 USCA § 4332 et. seq., 40 CFR §1502, §1503 et. seq. Plaintiff entitled to relief. Venue is proper due to Defendant property and activities in Ravalli County Montana which is within the Missoula Division of the US District Court for Montana. The Bitterroot Valley, where the Rocky Mountain Laboratory is located contains blue ribbon trout rivercourse Bitterroot River containing protected Species Bull Trout. Lewis & Clark traversed valley upon direction of US President to find a land route to the Pacific Ocean. Soils in the Bitterroot Valley are some of the richest in the state; water, timber resources abound surrounding the NIH facility in Hamilton, MT. The Selway-Bitterroot Wilderness is the second largest in the US at 1.6M acres, which sits at the western boundary of the RML site in Hamilton, MT. Wildlife crossings in ,Bitterroot are essential to habitat such as Bear, Moose, Elk, Deer, bird habitat of waterfowl, migrating birds, owls, hawks, bald eagles. RML site in floodplain for flood insurance: any part of property below the 100 year floodplain makes entire property floodplain, 1968 National Floodplain Insurance Act. Neighborhood surrounding RML south of Hamilton, MT contains historic homes over 40 years which require historical review for any federal project by NIH. NIH-RML drafted an Environmental Impact Statement (EIS) and Final EIS (FEIS) with appropriate comment period. NIH-RML drafted a 20 year master plan with appropriate comment period. Specific details for Interpretive Center and North Parking Lot projects in FEIS did not include required items as per the National Environmental Policy Act (NEPA). NIH-RML FEIS did not include alternatives to interpretive center project. FEIS did not include a historical review in report specific to the interpretive center, proposed parking lot project, purchasing residential property for NIH industrial use. FEIS did not allow public comment addressing the interpretive center, or the parking lot project specifically as proposed. Proposed Parking Lot project is near floodplain and drainage to Bitterroot River, and would require use of residential property purchased for a federal industrial purpose. Interpretive Center proposed demolition is within a historic residential area did not include alternatives to the proposed demolition of the existing structure 801, 803 S. 4th. In planning the new BSL-4 facility, NIH did not include professional fire, material safety personnel or fire structure assets at RML for safety, health of residents, employees. The 20 year plan and FEIS does not include an emergency response structure at RML. RML agreed to respect NEPA process, and uphold health and safety of community and RML employees in 2004 to resolve CV-04-154-M-DWM out of court. NIH BSL-4 facilities in Frederick, MD; Bethesda, MD; and Raleigh-Durham, NC have sufficient fire assets due to being in larger communities which have training and equipment necessary to provide emergency assistance to comparable facilities to RML. RML is located in an isolated valley with no professional fire departments, and no material safety teams within 45 miles, and 29 volunteer firemen in Hamilton, MT. NIH headquarters house 30 federal firefighters, and can get assistance from the well equipped Bethesda (MD) Fire Department, located within 15 minutes from D.C. metro. RML has no federal or professional fire personnel in any proximity to facility. RML 20 year plan had no onsite emergency response facility although no adequate biological, materials, or radiological safety team is within 45 miles. First Presidentially declared fire emergency was in proximity to RML, Ravalli County, and Montana in year 2000. Fire hazard is extremely high near RML. RML is 45 miles from Missoula, MT with 60,000 residents and five firehouses. Materials safety team is currently dispatched from Missoula Fire Department. Fallen timber block fire corridor route, accidents, and in-climate weather 3000 ft. AMSL, 47°Latitude; fire/materials response from Missoula not assured within 1 hour of dispatch. RML without professional material safety, biological, or radiological staging area available on site, or within 45 miles of the Hamilton, MT facility. NIH Office Research Safety issued Plaintiff false assurances of safety since 2007. Plaintiff has adequately participated in administrative process by expressing concerns to RML, NIH in fire safety, environmental quality, NEPA director, Director of Research Safety, NIH legal counsel, and NIH Directors office. Plaintiff has offered mediation to resolve this dispute to NIH. No further remedy is available to Plaintiff to resolve NEPA and related safety issues. FEIS and published NIH documents failed to adequately disclose, analyze, and assess environmental risk from proposed interpretive center demolition, parking project proposed by RML. Risks from RML proposed interpretive center, parking lot projects have impacts to the environment, human health, and impacts to local governments. Defendants did not comply with the NEPA act at RML. Defendants have duty protect safety and health of employees, public around RML. Defendants failed to answer electronic correspondence from Plaintiff addressed to askrml@niaid.nih.gov relating to fire safety. Defendants do not pay taxes to local governments, nor payment in lieu of taxes (PILT) to defray wear on roads, fire response, and other costs. Defendants are adding lab space at RML requiring more water resources, and have not addressed resource issue in the master plan, FEIS, or other published NIH documents. Water discharge from RML facility, or monitoring is not published or public information. Security of RML north boundary is substandard as non-fortified chain-link fencing. Purchase of residential property for RML is not proper for federal industrial projects. Industrial process as RML requires roof cooling fans, which impact bird habitat, and riparian, river area to west and surrounding RML and was not addressed in FEIS. Use of NIH police vehicles except official use, outside RML property, improper. Plaintiff repeats and realleges paragraphs 1-48 of this complaint as fully set herein. 50. NEPA requires NIH to consider alternatives to recommended courses of action in any proposal 42 USCA §4332(2)(E). Defendants consideration of a single action alternative does not satisfy the requirement that an agency prepare a detailed evaluation of all reasonable alternatives. 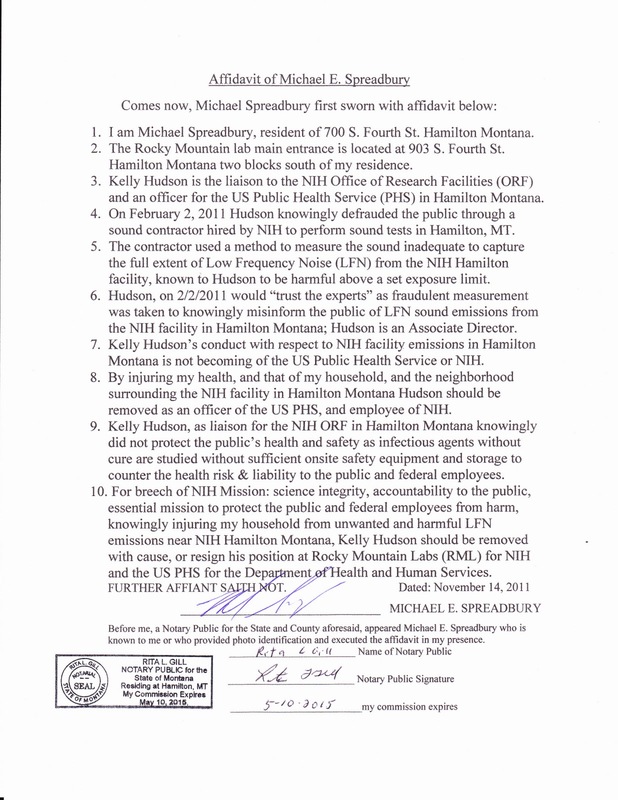 Failure to develop and consider reasonable alternatives by NIH with respect to the demolition of a dwelling, and a parking lot project is a violation of the NEPA Act. 54. Plaintiff repeats and realleges paragraphs 1-53 of this complaint as if fully set herein. 55. Defendants did not disclose impacts to the public about proposed parking lot project, interpretive center project, within EIS for public comment. 56. No alternative was presented to local fire services in 20 year plan, or current expansion. 57. Impacts to demolishing duplex residential dwelling at 801 and 803 So. Fourth St Hamilton, MT for RML interpretive center was not published in FEIS. 58. No alternative was presented for interpretive center or parking lot proposed projects. 59. Water use in further expansion of RML post BSL-4 has not been disclosed. 60. As a result of Defendants not disclosing substantive information, NEPA violation exists. 61. Plaintiff repeats and realleges paragraphs 1-60 of this complaint as if fully set herein. 63. Plaintiff comment and Public comments as to material, biological, and fire safety at RML were not adequately and meaningfully responded to in NEPA process by Defendants. 64. False assurances to safety by NIH did not adequately address public concerns. 65. RML did not respond to questions from Plaintiff and public regarding fire safety at RML. 66. Defendant’s failure to adequately respond to, or incorporate public comments into a FEIS process is a violation of NEPA. 67. Plaintiff repeats and realleges paragraphs 1-66 of this complaint as if fully set herein. 68. Defendants planned, and built level 4 BSL in Hamilton, MT at RML. 69. Increased dangers to employees and public were not met with sufficient resources to protect federal employees, federal property, and US Citizens residing near RML. 70. NIH did not treat RML equally in respect to health and safety as compared to other BSL-4 labs in other locations of the United States with respect to fire and materials safety. 71. Due to a failure of NIH to protect employees and the general public at RML, no fire assets or structures were built or planned as published in 20 year master plan and FEIS. 72. Plaintiff repeats and realleges paragraphs 1-71 of this complaint as if fully set herein. 73. Fire capabilities for local volunteer departments are not published in RML documents. 74. Volunteer fire departments do not protect other NIH facilities with BSL-4 labs. 75. The lack of disclosure by NIH of fire capabilities for RML does not meet duty to assess health and safety risks to the public, as found in NEPA laws. 76. Due the lack of disclosure by NIH, RML is not sufficiently protected as well as other BSL-4 laboratories in the United States. 77. Plaintiff repeats, realleges paragraphs 1-76 of this complaint as if fully set herein. 78. Defendants planned BSL-4 structure five years prior to construction at RML. 79. No fire facility was planned within the campus at RML although no professional fire or fully equipped hazardous materials safety team is available within 45 miles of RML. 80. By working with high level pathogens with no known cure or vaccine, without fire and materials safety infrastructure on, or near RML campus, Defendants were negligent in their duty to protect the public and RML employees. 81. Defendants knew or should have known that RML had less fire safety available to it than other NIH facilities with BSL-4 labs on their campuses. 82. Defendants are negligent in not planning or building sufficient fire assets at RML. 83. Plaintiff repeats, realleges allegations in paragraphs 1-82 as if fully set herein. 84. The failure to disclose and assess health risks constitutes a failure to satisfy the standard of scientific integrity, a violation of NEPA 42 USCA §4332 et seq, 40 CFR §1502 §1503. 85. Defendants did not disclose specific facts about fire capability, specifics about Hamilton Volunteer Fire, type of engines, type and frequency of calls, required training, average age & physical condition, requirements for volunteers, capacities and age of equipment. 86. NIH did not publish alternative to use of volunteer fire departments to protect RML. 87. Vagueness of FEIS, Master Plan, Defendants gave arbitrary and non-specific information on biological, fire, material, and radiological safety at RML. 88. NIH failed to give specific information for scientific integrity with respect to NEPA required documents such as FEIS, projects, and fire operations for RML. 89. Plaintiff repeats, realleges paragraphs 1-88 of this complaint as if fully set herein. 90. Defendants did not use EIS process to evaluate alternatives, gain comment from process, limit impact to environment on federally funded projects, but a means to gain the desired outcome of publicly owned resources. 93. Defendant NIH did have a disregard to EIS process with respect to Interpretive Center, Fire resources, and proposed parking lot at RML. 94. Plaintiff repeats, realleges paragraphs 1-93 in this complaint as if fully set herein. 95. RML uses resources from the public like water without delineating use. 96. The proposed expansion of RML will demand more water resources. 97. By not tracking, and publishing these figures, NIH is not upholding its duty to the public to wisely use local resources, or explain its use to public. 98. RML does not publish water quality figures after treatment, and release into the Bitterroot River in Hamilton, Montana. 99. RML has a duty to assure the public that the post-process water quality is below allowable levels, and is within tolerable limits of environmental protection. 100. Resource use is an impact to a community, and NIH has an obligation to the public via Federal Regulations and NEPA laws to disclose specifics on use, and protect resources from over-extraction, and assurances of best use practices. 101. Plaintiff repeats, realleges paragraphs 1-100 in this complaint as if fully set herein. 102. NIH, in FEIS did not disclose impacts all impacts to wildlife at RML. 103. FEIS stated 100 species of birds surrounding lab, yet published no impact to Riparian area due to no building in those zones on NIH property at RML. 104. NIH knew or should have known that impacts to wildlife would occur due to expansion and further expansion of the RML campus to add laboratory buildings. 105. NIH knew or should have known that an industrial campus near a wilderness river area and natural sanctuary for wildfowl on RML property would cause impacts. 106. 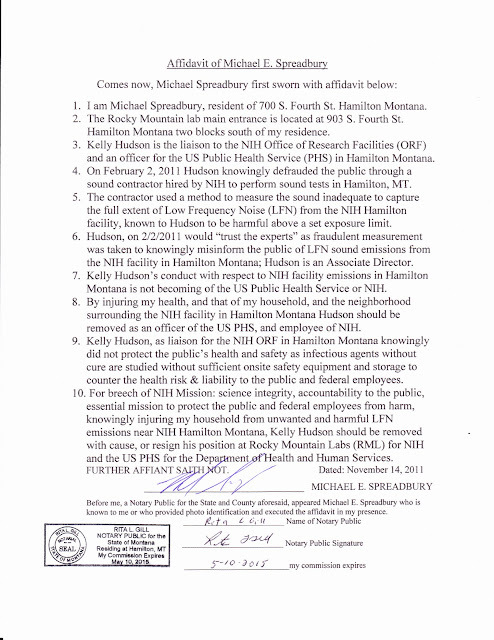 NIH was negligent in disclosing environmental sensitive areas on the RML campus. 107. Plaintiff repeats, realleges paragraphs 1-106 in this complaint as if fully set herein. 108. NIH did not disclose fire safety statistics, fact that no comparable NIH BSL-4 facility is protected by volunteer fireman in the United States. 109. NIH did not disclose impacts, alternatives to certain projects planned at RML. 110. NIH did not mention water use other than it was sufficient for fire flow. 111. NIH did not mention impacts for wildlife, or impacts to proposed projects. 112. NIH did not reveal land purchase expansion is zoned residential for planned federal industrial use for RML. 113. Due to misrepresentation, or omission, NIH did not disclose facts as required in EIS. Plaintiff respectfully requests that Court will find declarative ruling that the Defendants have violated the National Environmental Policy Act (NEPA), or other violations in all or part of this complaint herein. I. Issue temporary injunctive relief to enjoin Defendants to immediately raise fire assets of RML to the standard of other BSL-4 laboratories in the United States. II. Enjoin Defendants with cease order to stop building, on other projects at RML so fire protection can be brought to a suitable level consistent with relief sought in I.
III. Make declarative judgment whether Defendant federal agency can purchase private zoned residential property for use as federal industrial property at RML. IV. If affirmative in III, enjoin Defendants to re-issue EIS process to include alternatives, public comment, and other NEPA requirements on proposed parking project at north central portion of RML site, and interpretive center project. V. If negative in III, enjoin the Defendants to maintain the integrity of the historical neighborhood at RML main entrance and refrain from the proposed interpretive center project, and parking lot project at north central RML property. VI. Enjoin Defendants to secure flood insurance for all structures on RML required by National Flood Insurance Act of 1968 per US Congress Legislation. VII. Enjoin Defendants to regularly disclose to the public water use, expected water use, treatment standards, and contaminant levels of effluent discharged into the Bitterroot River at Hamilton, MT. VIII. Issue permanent injunction to enjoin Defendants to prepare an EIS which follows the NEPA law to the benefit of the public with respect to the Interpretive Center, impacts to wildfowl, and all future and current federal projects at RML. IX. Plaintiff asks court to grant any costs that arise from this action. X. Plaintiff yields to court any further relief court deems proper in this action. If you are a prospective employee, do you want to work where Ebola and other infectious agents are analyzed, without proper emergency protection, which might kill tens of thousands of innocent Americans all to further your CAREER? Science was never about endangering people, or affecting their health. Up until RML built their level four biolab in Hamilton MT.